to anyone who would listen and sparking a discussion in the office around trans fat. After a smidgen of more careful thought we agreed that if an ingredient list contained the words “partially hydrogenated” that there was no doubt it contained trans-fat, and that if an ingredient list contained the words "fully hydrogenated” that it meant no trans fat. However the question remained, what does the non-elaborated on lonely word “hydrogenated” mean in terms of trans-fat? Not so helpful even for those reading labels, is it? And what of the nutrition facts panel, can we look to it for guidance? 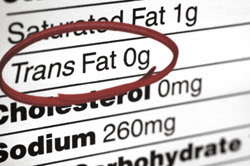 In the United States, labelling laws and the wording is similarly ambiguous, with even higher allowable trans-fat amounts in a “trans-fat free” product at 0.5g/serving or less. BUT, the U.S is currently taking the right steps to try to eliminate partially hydrogenated oils from their entire food supply, and it would seem here that Health Canada is not only doing nothing, but they have made it exceedingly easy for the food industry to dupe even label reading Canadians. "toxin unsafe in any amount". My question for Health Canada is simple - why the ambiguous wording around an ingredient that is a known health risk, especially given your outright refusal to regulate it as your current definition seemingly only serves to benefit the food industry and not the public? My recommendation for now is straightforward. When considering a product, unless you see the word "fully" right before "hyrdogenated", or if you see shortening anywhere in the ingredient list, put the item back on the shelf.